In late 1993 DDM had just put his son to bed and was musing through his toy basket. LEGO bricks were prominent. DDM tumbled bricks between his fingers and began to think of what could be done if they were digital, if they could be modeled and drawn using 3D computer graphics. In fact, he thought, it would make sense to have a database of such bricks, so he could build virtual LEGO models of any number and size. 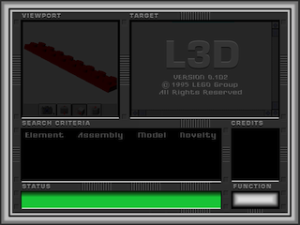 With a database of models, each brick would have to be created only once and then used repeatedly as needed. And what better way to show this than to make an animated movie! With these thoughts in motion, DDM began to think about the story the movie would tell. He would also need a lot of computers, software, and, he soon realized, also some help. He soon found Claude Aebersold and Alex Furer and recruited them for the project. In 1993/94 personal computers were significantly less powerful. Memory was very expensive, and disks still cost so much that everyone had to be careful about storing too much data. They weren’t very fast, either. The LEGO Movie was animated for the most part with Strata Studio, and fixes and special effects were done by hand in Adobe Photoshop. DDM insisted on high quality imagery, so they firstly took a long time to render, and then the rendered images took a long time to load into Photoshop, sometimes as long as 45 minutes for one frame. It wasn’t all tedium, though. The studio was located on the ground floor of a chalet halfway up a Swiss alp, the Niederhorn, so while the computers were busy chunking away on tasks, the three of them could take breaks outside, admiring the tremendous view of Lake Thun and the Alps on the other side, occasionally punctuated by the Swiss Air Force flying F-16s, practicing below them. After eight tedious months of animation the movie was taking shape. DDM brought an almost complete cut to SIGGRAPH 94. It was on a small portable digital media player. DDM also insisted on high quality sound, so the best way to appreciate the movie was to be carefully watch the video player’s screen, with headphones. It could have been in the SIGGRAPH film show. It wasn’t the right time, though. DDM’s intent was to actually get LEGO involved, to make them understand that they HAD to do this, to make a database of 3D models of their bricks and model sets, and to start leveraging their other processes, such as building instructions, from that database. Even more, they needed to expand, to create LEGO movies and LEGO computer games, and have a digital LEGO presence on the brand new World Wide Web, which had just come out and was starting to get a fair amount of attention. A few months later, with the movie complete, DDM went to LEGO headquarters in Billund, Denmark. He planted himself in the Legoland Hotel and refused to budge until he got an audience with LEGO’s owner, where he could show him the movie and tell him his visions. But this is a subject for another chapter. You can watch the movie right here and read some additional commentary on Alex’s blog about the making of the movie. Make sure to watch it with headphones, and also watch for the little tidbit at the end. Click on the picture to play the movie; for some reason the Play triangle isn’t showing. The LEGO Movie was produced by Animagica Productions, which was later acquired by LEGO. This entry was posted in General, History, Multimedia on February 7, 2014 by Julian Gómez. In 1995 LEGO conducted a study to determine how to become “digital” – how to do it and what it would take. This study took place from May to October in a secret lab on the third floor of LEGO headquarters, Legocentret. At the end of the study LEGO management received a report detailing programs, people, and resources needed to move into the new paradigm. LEGO quickly approved the plan, and SPU-Darwin was set in motion at the beginning of the new year. This website is the story of SPU-Darwin, of moving LEGO into the 21st century. I’m not sure yet how to tell that story, so it’s organized as a blog. This will allow me to present pieces of history as they come, without worrying about having to have everything set before presenting anything, and will allow me to experiment with presentations. Also, a great deal of leading edge science and engineering had to be developed, and those stories will require intense technical material, which might not appeal to everyone, and those entries will be separate from the general ones. To Darwin members: the blog structure of this website is expressly designed to allow everyone to chime in with their memories. Please do that. Periodically I’ll go through the topics and concentrate them down into organized stories. It’s my hope that this path will eventually lead to an actual publication someday, like an interactive multimedia book, but we’ll worry about that later. I’m not a designer, so if you’d like to contribute anything about this website design, PLEASE do so. Note: only Darwin members (which is not just LEGO employees, it’s everyone who was intimately involved – this means you, SGI and Informix and DDE) will have editing access. Everyone else can email, which will be dealt with separately. This entry was posted in General on May 14, 2013 by Julian Gómez.